The founding fathers were uneasy about democracy, so they twisted it into a knot. In 2016, we tend to use the terms “democracy” and “republic” interchangeably, but back in the 1780s there was a definitive line drawn between the two. In fact, most of the founding fathers — well, the Federalists anyway — weren’t so hot on direct democracy. They feared that the voting public, left to its own devices, would elect demagogues and liars instead of wonks and leaders. Did they predict Donald Trump’s campaign? Not as specifically as Hillary Clinton might wish us to believe. But James Madison, Thomas Jefferson, and George Washington were still such astonishing political futurists that, two and a half centuries later, it’s still worth looking backwards when attempting to figure out what might happen next. To whatever degree America was founded on Judeo-Christian morality, it was founded more on guesswork. The bewigged colonials in Philadelphia didn’t just debate mechanism of governance, they attempted to preemptively cure social and political ills, which meant thinking critically about the technologies and social norms driving the economic and physical expansion of what had been a series of Atlantic outposts. The instructions they came up with were equally optimistic (the pursuit of happiness!) and cynical. The equal branches of the federal government were created to be what Madison described as a “necessary fence” between America and true democracy. For statesmen like Madison, Jefferson, Adams, and Hamilton, democracy was a fancy word for mob rule. And once mobs start competing, you get factions, and if there was anything that scared the founding fathers more than democracy, it was factionalism. A country defined by its factions and governed by a majority interest, they figured, would likely succumb to tyranny. The framers understood that reserving powers was the only way to make sure the representative of the people acted in their best interest. They created a system designed to be contentious and inefficient in order to make sure that both politicians and citizens could never be too legislatively efficient. 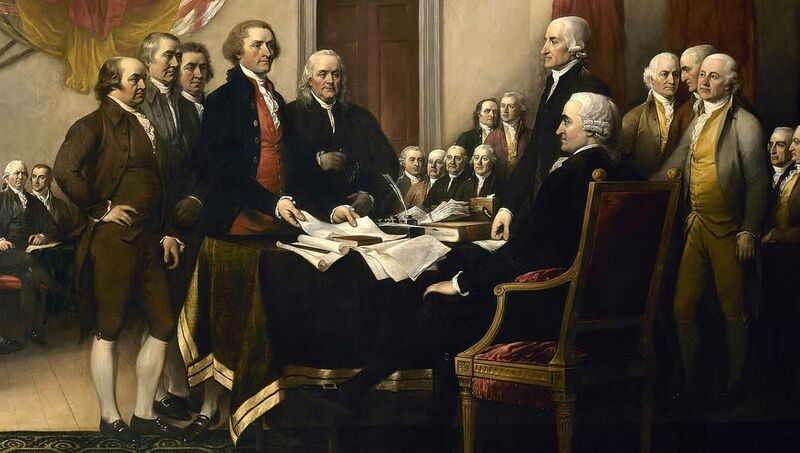 The writers of the Constitution were not populists — even for their time. They were men who felt that the country’s best chances of success lay in the hands of informed, moral, and public-minded white men who could form a permanent political class. The original system of voting elites speaks to that: in most states, only landowners could vote for House Representatives. Senators were appointed by their state’s governors or elected by state legislature rather than popular vote, and the President was chosen by specially appointed electors (hence the electoral college). Thankfully democracy — in the sense that we know it now — was introduced slowly (much too slowly for most) into our system of government. And the country became better for it. Yes, factions cropped up early, but the safeguards baked into the Constitution — like requiring two-thirds majority from the House and Senate to amend it — meant permanent changes to the government at the behest of the majority were almost impossible. The founding fathers’ system worked, but not in the way they suspected it would (well, maybe in the way Franklin thought it would). The people made decent choices. There were bad leaders — here’s looking at you, Hoover — but no strong man ever took over Washington. Given that history, the level of panic on the left about a potential Trump presidency seems surprising. Why the sudden distrust of a system that has worked so well for so long? Why the sudden distrust of the men who saw this coming and planned for it? Donald Trump is a White supremacist-courting authoritarian who has publicly offered financial support to anyone willing to physically assault his detractors. He has already threatened to use the power of the presidency as a weapon to silence members of the press who criticize him. But what gets lost in the furor over his racist comments about an American-born judge’s inability to be impartial is that the Trump insurgency is essentially the emboldening of a faction. And our whole system was built to protect us from factions. Part of the reason that Trump’s relationship with the Republican Party is so fraught is that his base is smaller than the party’s on account of not being animated by ideas. Whatever you think of “smaller government” as a goal of government, it is a coherent political idea. Trump doesn’t traffic in those. Instead, he panders to a disillusioned group of Americans looking to “take back” their country. That is the language of factionalism. Politicians govern. The leaders of factions try to take stuff. George had a thing for complex sentence structures, but he also had a thing for government, which is to say that he was for it regardless of factionalism. Before ending his speech, he added something close to an addendum to his remarks on despotism, prescribing “a government of as much vigor as is consistent with the perfect security of liberty.” Did the first president understand that the appropriate level of “vigor” would remain the most contested debate in political life for the following two centuries? Maybe. Maybe not. But there’s reason to believe that he understood more broadly that government represented a cure for despotism. In other words, he understood that the participation of leaders in the system he helped construct would temper them. Would they still be able to inflame factional passions? Sure. But Washington was a soldier and he understood that rhetoric and power don’t necessarily have anything to do with each other. The founding fathers predicted that a candidate like Trump would come along, but that wasn’t their only prediction. Swaggering egotists that they were, they predicted that the government they had devised would defeat efforts to divide America into factions. They predicted that demagoguery would remain a threat, but that it could be preemptively defused by forcing the power hungry to be accountable to constituency after constituency as represented by senators, congressman, and, sure, judges. They predicted that the problems presented by democracy could be solved by more democracy. Not only did Washington and Madison see a Trump candidacy coming, they saw a Trump presidency coming. They predicted it would happen and prepared for it. That might feel like cold comfort to minorities or people who care about foreign policy, but trusting the colonial futurist has worked pretty well so far.